Delicious party dip! Every time I make it there is never any left, and everyone is always asking me for the recipe. It's so popular I've never even had time to take photos of it, so this is a stock photo. In a mixer, blend the cream cheese on low until softened. Add sour cream and Worcestershire sauce, mix well. Next add bacon and onion and mix well. 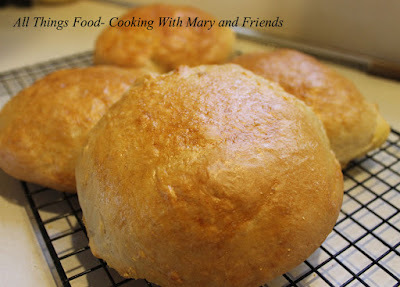 Cut the top and hollow out bread bowl (leave 1/4" minimum around the edges). Cut the top and inside bread into bread hunks for dipping if you want or discard. Spoon cheese mixture into bread bowl and wrap entirely in aluminum foil. 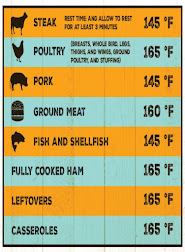 Bake 325 for one hour or more until thoroughly heated. Serve with bread hunks, crackers, fresh veggies, whatever you want. Thanks Joy! It really is very good, and super-simple. 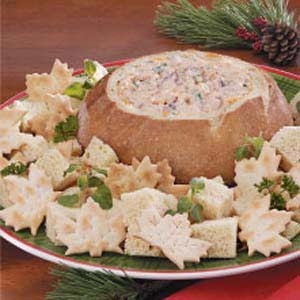 You don't have to serve it in the bread bowl, but it does make a nice presentation, and everyone loves it!